In order for a stakeholder to take out something of value from the (extranet) level they have access to, they must in turn put something in: For the industrial seller in this study, time, money, effort and talent are all a part of putting the value-added service it provides to its customers. What the seller takes out is a more satisfied customer and the opportunity to become proactive in handling customer problems versus only reactive. The extranet is not the "crystal ball" they might want, but it's the next best thing. In the end, the industrial selling organization gets out of their input an improved relationship with its customers in what is becoming an increasingly competitive environment. They are also able to better serve their customers' needs while at the same time saving resources, as the speed to react to customer needs or problems is greatly increased via the use of the extranet. Industrial buyers also have value inputs into the extranet: Their use of the extranet provides the seller information through not only downloading order-specific information, but also other types of documentation that otherwise required them to save on their own computer or in a notebook on an office shelf. For industrial buyers, time, which they consider highly valuable, is not only put into using the extranet, but they also take out (i.e. save) time. In general, what industrial sellers get out of this extranet is the value of having the right information (current, order-specific information as well as historical data), at the right time (i.e. right now), and in the right way (never more than a few clicks away, with e-mail reminders of when new information is available, or perhaps in the future, via a web link directly from the e-mail with no logon necessary). Tim Foster development of a B2B online value-creation model shown in Figure 3. 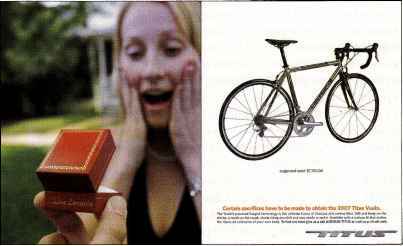 The "wedding band" visualization shown on both sides of the B2B online value-creation model above is no accident. 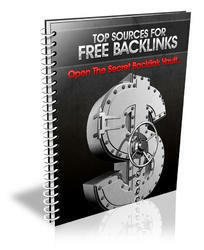 It demonstrates that, as in other forms of legally-binding relationships (e.g. "marriage"), where a formal contract is put in writing and an informal one (trust) is often taken for granted, both sides of this relationship must work together and each should have something to offer if true value is to be created. The findings of this study indicate that both seller and buyer must, in order to take out value, collectively and/or individually provide it as well. The model also represents the importance of the link between the online and offline environments, supporting Porter's (2001) contention that true value is created when integrating the internet into overall (including offline) strategy. 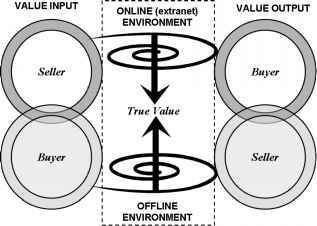 The spiral effect of value emanating from both the online world and the offline world shows that the value input of the industrial seller becomes the value output of the industrial buyer, while the value input of the buyer becomes the value output of the seller. Such a spiral could also provide a basis for certain value inputs and outputs being preferred over others, as was found in this study. In support of Chakraborty et al. (2003), organization of the web site, nontransaction-related interactivity, privacy/security, and how informative the site was, were also important, whereas transaction-oriented interactivity and entertainment value were not. This also implies that the argument from Sharma (2002), i.e. that "information" was of the least value, needs to be reconsidered. Regardless of where one starts, be it with the selling or buying organization, and regardless of whether it is an input or output, the idea is simple: The more value that is provided and used between the seller and buyer, coming from both online and off, the more "true value" (seen at the heart of the model) is actually developed. What binds industrial sellers and buyers is metaphorically laid out by Phairor and Hanmer-Lloyd (2002): The extranet in this study can in fact be seen as the communication "super-glue" that brings together and creates mutual value between both sides of this focal seller-buyer relationship, but only if both are willing to create value and not just become the beneficiary of it. The extranet is indeed the heart of the I-E-I framework. What remains to be seen is if this "super-glue"
holds for other relationships throughout the value chain network and within the other layers of the I-E-I framework.